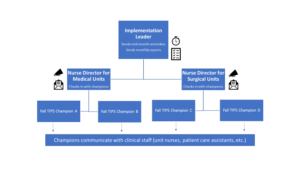 After securing hospital leadership support, your next step is to gain support from nurses, who are critical to successfully establishing Fall TIPS on the floors. They’ll need to understand what Fall TIPS implementation entails and the different modalities available. We have also found that it is important for nurses to understand the science behind Fall TIPS and why they are making this practice change. Meetings that govern nursing practice and patient safety are a great forum for informing nurses about Fall TIPS and gaining their support. Fall TIPS is the only fall prevention program with over a decade of research showing that it prevents patient falls and fall-related injuries in hospitals. 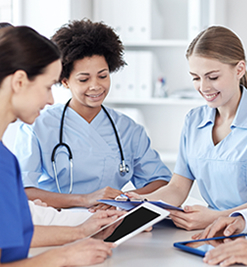 A key aspect of Fall TIPS is direct nurse collaboration with patients and their families. 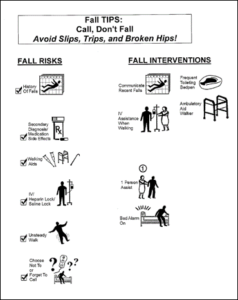 Fall TIPS uses the Morse Fall Scale (MFS) – the most rigorously validated fall risk assessment tool for in-patient hospital settings – to guide nurses in conducting a valid patient fall risk assessment with patients and families. Each risk factor on the MFS is linked with one or more actionable evidence-based interventions listed on the poster. 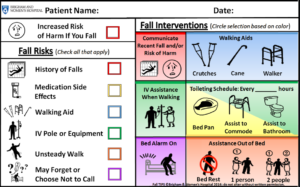 Nurses fill out a laminated or electronic version of the Fall TIPS bed poster, tailored for each patient’s specific risk factors, at the bedside. Interact with the patient to jointly complete a fall risk assessment using the MFS. Create a personalized care plan via the Fall TIPS poster, detailing interventions that are based on the individual patient’s risk factors. Collaborate with the patient, family, and the full care team to consistently implement the interventions. The nurses you’re meeting with are also potential Fall TIPS champions. To gain their buy-in, and possibly inspire interest in becoming a champion, tell them about the feedback loop they’ll participate in; assure them there will be thorough education and training for nursing staff and other care providers; and let them know they’ll receive data detailing their unit’s success, the hospital’s overall success, and other hospitals’ successes with Fall TIPS. DATA AND FEEDBACK: Part of the benefit of using Fall TIPS program is that nursing staff will receive monthly feedback in the form of audit data and reports about how well the implementation is proceeding, such as how their fall rates compare to those of other institutions. Explain that the implementation team will provide this data and ensure a steady stream of communication to provide feedback. A PowerPoint presentation designed to educate Fall TIPS Champions on how to complete the three-step fall prevention process. This presentation includes slides on the evidence behind Fall TIPS and how to conduct a fall risk assessment using the Morse Fall Scale. It also includes three breakout exercises: a fall prevention best practices gap analysis, a peer feedback exercise related to the Fall TIPS auditing process, and a series of case studies with answers. A concise PowerPoint presentation designed to educate staff nurses on how to complete the three-step fall prevention process. Focuses primarily on how to conduct a fall risk assessment using the Morse Fall Scale and includes a case study at the end. A one-page guide that includes instructions on how to use Fall TIPS and lists answers to FAQs. A one-page guide that explains how nursing assistants can support nurses using Fall TIPS and lists answers to FAQs. A guide on how to conduct the Fall TIPS Audit. Encourage the committee to set a deadline for these decisions while you’re meeting with them. Ideally, the decisions would be at or before the next practice committee meeting. While both modalities have been found to be equally effective at engaging patients, some units may prefer one version over the other, for various reasons. NOTE: Hospitals often require their Infection Control Services to approve the location where posters are placed in rooms (for both laminated posters and electronic EHR printouts). The timeline for approval can vary, so it’s advisable to involve this group early. Laminated 11” by 17” posters can better engage patients in the fall prevention plan (depending on the patient population) because the icons are larger and the bright poster is eye-catching. Translated posters are available in the following languages: Arabic, Chinese, French, German, Haitian Creole, and Spanish. The color is designed to provide clinical decision support linking the patient’s risk factors to the evidence-based interventions. Nurses must integrate completing the Fall TIPS risk assessment and tailored interventions into their workflow as a manual process. Integrated into the EHR, so nurses can engage the patients as they document the fall risk assessment and personalized fall prevention plan. The patient’s fall risk factors and tailored interventions automatically populate the Fall TIPS electronic printout, which the nurse prints and hangs in the patient’s room. Provides electronic clinical decision support linking the patient’s risk factors to the evidence-based interventions. Amount of work it will take to implement depends on which EHR your site is using (at Brigham and Women’s Hospital, we use EPIC). More expensive – requires licensing the technology. If the computers where nurses complete their documentation are not connected to a printer, this could be a barrier and would need to be addressed prior to implementation. Posters are smaller (8.5” by 11”) and may not stand out to the patient in the hospital room, depending on the size of the room. Requires printing a new piece of paper for every patient, whenever the patient’s plan changes, so is less environmentally friendly. While there are pros and cons of each modality, we have found that the each one works well as long as it is integrated with the current hospital workflow. Explain that the ideal champion will be fully committed to the program’s success and will own the implementation in their units. Nurse managers/nurse directors can often be very helpful in recommending and securing champions. 1Bouldin ED, Andresen EM, Dunton NE, et al. Falls among Adult Patients Hospitalized in the United States: Prevalence and Trends. Journal of patient safety. 2013;9(1):13-17. doi:10.1097/PTS.0b013e3182699b64. 2Hitcho EB, Krauss MJ, Birge S, et al. Characteristics and circumstances of falls in a hospital setting: a prospective analysis. Journal of general internal medicine. Jul 2004;19(7):732-739. 3Tinetti ME, Mendes de Leon CF, Doucette JT, Baker DI. Fear of falling and fall-related efficacy in relationship to functioning among community-living elders. Journal of gerontology. May 1994;49(3):M140-147. 4Morse, J. (2009). Preventing Patient Falls: Establishing a Fall Intervention Program, 2nd edition. New York: Springer.